Hi everyone, I am busy today as I have plan with my son. We are hoping to catch a movie today if there's time. The movie we have interest to watch is Hotel Translyvania. Today is going to be mother and son day out. Oh don't forget my giveaway at other blog, just click the image to take part! One lucky winner wins the above giveaway consist of skin care kit and handmade cell phone charm plus Mickey Mouse badge! It is wonderful having giveaway to appreciate my followers. 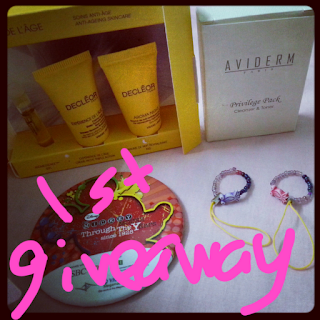 I haven't got the time to check the entries of giveaway on this blog, so keep the entries coming yeah! It is going to be busy month for me, hoping this month able to purchase school uniform for my son. He's entering Primay One next year, will be challenging for him. One of his classmates backout from the school because she has no interest in Chinese language, you know it is difficult to learn the strokes. Education never stop even we are getting old we are still learning.